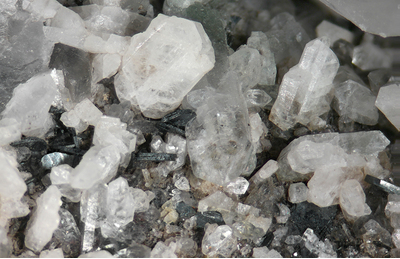 Quartz crystals formed in cavities in brecciated Plainville Formation quartzite. Brecciation was caused by the Snake Meadow Brook Fault, related to the Lantern Hill Fault, which was silicified 238 Ma (Middle Triassic) (Altamura, 1995). The main exposures occur along the former railroad bed (Coventry Greenway) extending northeast from Brunswick Avenue, parallel to the east side of the Moosup River and south of State Route 14. The site is a railroad cut, not a "quarry" (Robinson and King, 1989), nor is it correctly called "Diamond Ledge", which refers to a similar quartz occurrence in West Stafford, Connecticut. Discovered in the early 1980s, after much of the slope was dug, private property encroached upon, and spoil dumped in the pathway, the state Department of Energy and Environmental Protection covered and shored up the exposure and as of 2010 there is very little left to collect. Reportedly abuse of this state locale (and adjacent private property) led to the permit system now required for any collection on state land, which is limited to only 3 places - not including this one. Description: Small crystals in a vein cross-cutting gray quartzite, with quartz and hematite. Description: Massive to earthy to crudely columnar in structure, formed within brecciated pockets long after the quartz crystallized. 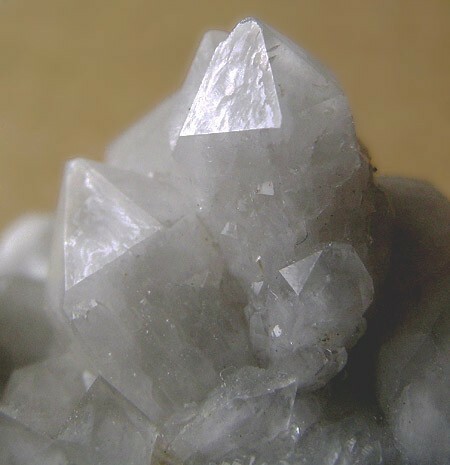 Description: Small crystals in a vein cross-cutting gray quartzite, with quartz and albite. Description: Voids of all sizes host subparallel, prismatic quartz on the walls, which grew from grains in the brecciated quartzite. 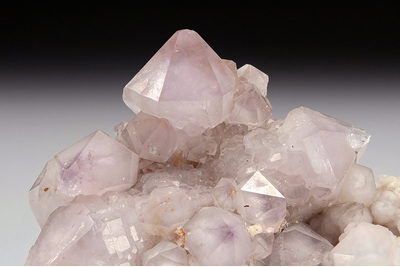 Crystals can be colorless and clear or milky with parasitic "corn-cob" crystals. Scepter overgrowths, some amethystine, also occur. Crystals can reach 8 cm. Reference: Clark, Bill. (2001). Connecticut Quartz: Interesting Specimens from a former Collecting Site. Rock & Gem: 31(8). 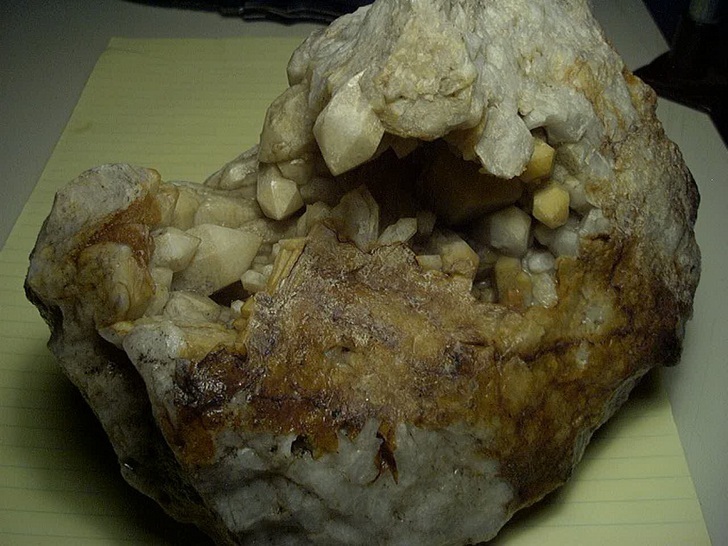 Description: As scepter overgrowths on other quartz. Description: Voids of all sizes host subparallel, prismatic quartz on the walls, which grew from grains in the brecciated quartzite. Crystals can be colorless and clear or milky with parasitic "corn-cob" crystals. 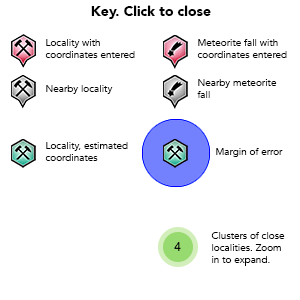 Scepter overgrowths also occur. Crystals can reach 8 cm. Description: Interlayered light-gray, thin-bedded quartzite, in places with feldspar, mica, graphite, or pyrite, light- to medium-gray gneiss composed of quartz, oligoclase, and biotite (rarely microcline), medium- to dark-gray schist composed of quartz, oligoclase, biotite, sillimanite, and garnet, dark-gray or green gneiss composed of plagioclase, quartz, biotite, and hornblende (commonly with diopside), amphibolite, diopsite-bearing quartzite, and calc-silicate rock. 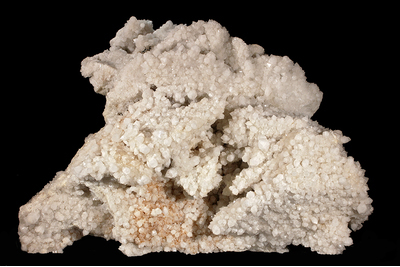 In places contains quartz-sillimanite nodules. Robinson, George and Vandall T. King. (1989). 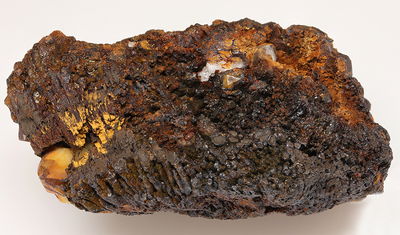 What's New in Minerals? Sixteenth Annual Rochester Academy of Science Mineralogical Symposium. Mineralogical Record: 20(5):390. Altamura, Robert J. (1995), Tectonics, Wall-Rock Alteration and Emplacement History of the Lantern Hill Giant Quartz Lode, Avalonian Terrane, Southeastern Connecticut. Trip E in Guidebook for Fieldtrips in Eastern Connecticut and the Hartford Basin. Northeast Section Geological Society of America 30th Annual Meeting. Department of Environmental Protection Guidebook number 7. Clark, Bill. (2001). 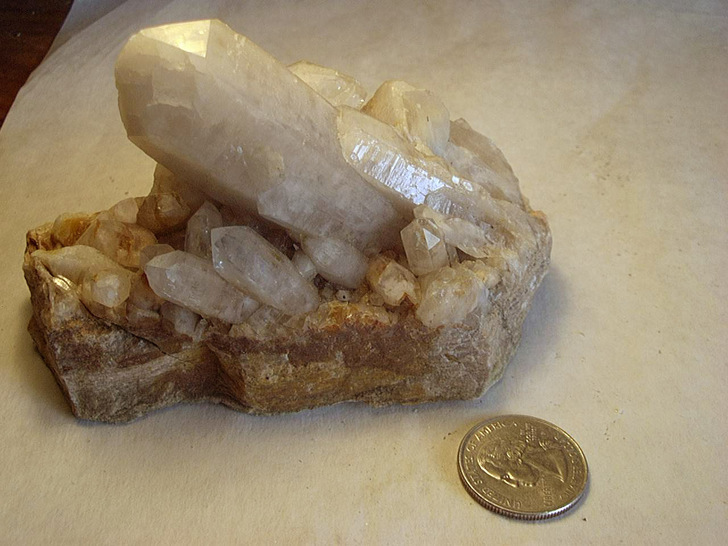 Connecticut Quartz: Interesting Specimens from a former Collecting Site. Rock & Gem: 31(8).